When our cells are not fully hydrated they cannot function at their optimal level. This leads to much of the tissue damage that we call ageing. The HydraFacial takes its name from the root word hydrate "to cause to take up moisture". The ability to moisturise the skin separates the HydraFacial from all other skin resurfacing procedures and it can also be customised to treat all skin types and conditions. A pick-me-up that exfoliates extracts and rehydrates dull, tired-looking skin. Powerful jets of cooling water combine with botanical extracts to remove dead skin cells and impurities, while simultaneously bathing the new skin with cleansing, hydrating and mositurisng skin solutions. The treatment is soothing, refreshing, non-irritating and immediately effective, resulting in clearer, brighter, fresher and more youthful skin. Customised to detox, purify and control breakout, congested and problematic skin. Deep-cleansing and exfoliating using formulated anti-bacterial serums in combination with a vacuum-based skin abrasion tip, removes dead skin cells, and extracts impurities. Next a customised concentration of Salicylic Acid is delivered deep into the dermis layer of the skin via the Hydropeel Tip, combined with calming blue light LED therapy, destroys acne bacteria. The combination of the Hydropeel as a pre-treatment to the blue LED light means that dead skin and debris is removed first, so that the blue light is better targeted and absorbed by the acne prone skin layers beneath. A series of six treatments, one treatment a week is recommended for improving the appearance of oily/acne prone skin. A visible difference can be seen after just one treatment. Following a course of six treatments the visible improvement is maintained with just one treatment every four to six weeks. An instant refreshing and uplifting boost for tired, thirsty and lethargic skin. A hand held wand is used to deliver powerful jets of cooling water combined with botanical extracts to gently exfoliate and deep-cleanse the skin; using the patented tip technology this dislodges dead skin cells, loosens sebum deposits and prepares the skin for extractions. Next a customised concentration of Beta Hydroxy Acid is delivered deeply into the dermis layer of the skin to flush out any black heads, blocked pores and to reduce pigmentation. The Beta Hydroxy Acid is then passed over any surface deep lines and wrinkles to smooth and plump up their appearance. A cocktail of six anti-oxidants, including vitamins A and E, White Tea Extract, along with Hyaluronic Acid is then pressed deep into the skin for intense re-hydration and anti-oxidant protection. Rejuvenating red light LED therapy is then passed over the skin which stimulates the production of healthy new skin cells and collagen fibres, producing an instant brighter, more tightened feel to the skin. 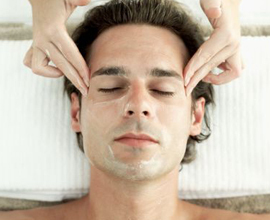 This is followed by a bespoke mask to leave the skin looking firmer, lifted and luminous with immediate effect. To deep-cleanse, exfoliate and re-balance for smoother, more flawless skin. Customised to your skin's needs, a hand held wand delivers powerful jets of cooling water combined with botanical extracts to remove dead skin cells and impurities while simultaneously bathing the new skin with cleansing, hydrating and mositurisng skin solutions. This is followed by calming visible blue LED light therapy and a customised mask with a hot towel compress, to soothe and refine the skin. A relaxing massage completes the treatment.